I've promised to do a diy tutorial for my graphic shirts once I get my hands on fabric paint. I apologise for not updating for so long because I have been busy with school. My recess week just started, so I have some time to diy more shirts and do up a tutorial for you guys! The popular Brandy Melville graphic shirts can now be replicated with a bit of patience and time at your hands! This tutorial is suitable for any typography kind of graphic shirt. The materials needed should not cost you much. You can dig around your house for old plain shirts or find some at a thrift store/flea market. In case you are wondering what glue and fabric paint I use, here they are. The glue is by Zig and it actually dries to form a temporary bond that has the strength of a post-it. I got it from a scrapbook store for about $5 I think. It was a long time ago and I never thought I'd have a use for it. The fabric paint costed me $4.50 from art friend at Takashimaya. I think it was the only fabric paint brand around unless I'm blind. I looked through all the shelves of paint and there were loads of acrylic and oil paints but no fabric paints except this. Print out your stencil on paper. In this tutorial, I am trying to imitate Brandy Melville's You Can't Sit With Us shirt. I used the font Trade Gothic No. 20 - Condensed in 135 pt. You can scale it up more if you'd like because the print on the actual shirt is quite big. You can download the font for free online, then type it out on a landscape word document. Then, you are going to take your pen knife or cutter and cut out all the alphabets. If you are using freezer paper, place the freezer paper over the print out and cut out the alphabets. Make sure that you have placed your freezer paper with the wax below. Remember to cut and keep the insides of alphabets such as "O" and "A". I think this is the easiest quote I've done to cut out so far because it mostly involves cutting straight lines and edges. You should be able to finish this in 15 minutes. If you are using freezer paper, iron the freezer paper onto your shirt. If you are just using paper, apply glue to all the cut out edges of the paper and stick it onto your shirt. The glue I used does not leave a residue so do a patch test first. This step ensures that the stencil does not move as you are painting. Place a few pieces of paper/cardboard under your shirt so that the paint doesn't seep through. Squeeze out some fabric paint elsewhere (I used a plastic sheet). Then, take your makeup sponge and dab some on. Learn from my mistake here. Your sponge should not be dripping with paint, rather you should dab and re-dab until there is only a thin layer of paint on the sponge. If you load too much paint onto your sponge and apply, the paint is going to end up bleeding and smudging through the edges. Dab the sponge onto your shirt. It is okay if the first layer turns out light and not everything is covered. I did about 3-4 layers of paint before everything was painted. This took 30-45 minutes to finish. Your patience will definitely pay off. Leave the paint to dry for awhile then peel off your template! I find this step rather fun to do. If you have done it right, the edges of your alphabets should be rather neat and straight. You can still choose to outline the alphabets with white paint to tidy it up. However, once I do that, I'd want to outline every alphabet and that would take a rather long time. I did this with my two previous shirts because I overloaded my sponge with paint. This one turned out fine though because I learnt my lesson. Here's the end result and I must say that hardly anyone would realise it is a DIY shirt unless you tell them! Heat set your print after 24 hours or as directed by your fabric paint bottle instructions. I also cut off the sleeves and cropped some so to make them into muscle tees instead. 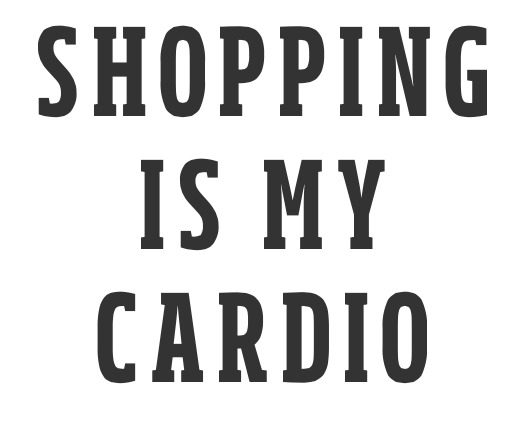 Another one that I did earlier on, Shopping is my cardio. I don't think the font for this is free but you can download the picture here and scale it up on your word document. And finally, I outlined this freehand because the text was too small and thin. I love you to the moon and back in Courier 35pt. I just placed the paper under the shirt and traced out the alphabets. You'd need a relatively thin brush for this though. Be sure to share your creations with me in the comments!